July 2016 – Page 2 – Let's Go RVing! Yesterday was a travel day. We intended to get up early, ride bikes and then be on the way but I knew Jerry had had a bad night and he had a long day of driving ahead so I didn’t wake him. In fact he didn’t wake up until 8:30. He had read the night before that one way to lose weight while cycling is to ride without breakfast so we tried that today. I really couldn’t tell any difference in my ability to conquer 6 miles. It’s mostly level ground so that makes it easier. The first four miles are not that hard but the fifth one – wow, and the sixth one I just keep counting down! We left about 12:00 and though it’s just a little over 100 miles it took us 3 hours to arrive. The road is two lanes, curvy, bumpy in places and a slow drive. We did drive through Petoskey which is a beautiful town but I was on the phone with Ivy planning our Louisville trip so I really didn’t see much. We slowly crossed over the Mackinac Bridge due to road construction and arrived at Tiki Campground in St Ignace, MI. We got the Passport rate and only paid $105 for 5 nights. Our site is kind of up on the edge of the campground – hope we don’t roll over during the night! We can see Lake Michigan though. Wi-fi as usual is iffy even with the booster. The booster can’t boost what isn’t there! I do wish campground hosts would not advertise free Wi-Fi if it is so poor. I’m watching our data on our phones carefully since I know there is no Wi-Fi in Asheville, our last destination. Thursday we got up early, dressed and had our bikes at the office by 8:30 waiting for the shuttle to Sheplar’s for the ferry ride over. The weather was nice as it had cooled down a bit and the sky was clear although rain was predicted. We were the last pickups so the ride there took less than 5 minutes. We had planned to sit on top but they made it clear that we would get very wet, like “bathtub” wet so along with many others we went downstairs. Although the route was supposed to take us under the bridge the captain wasn’t sure that would be possible due to high waves, 2-4 feet. We did go under it though and it is amazing! On to Mackinac Island and oh my goodness. People, horses and bikes everywhere. We carefully rode our bikes down main street and then around the block. We had packed the backpack and it was in my basket on the back of my bike. It so changed the bike weight that I couldn’t ride with it. We parked our bikes at a bike rack and then ambled around. We went to the Visitor’s Center and for a few minutes just looked lost as we gazed around at the fevered activity. We finally decided to take a horse and buggy ride around the island. It was $120 or $60 per couple. We ended up sharing with another couple. The problem was that it was cash and between the two of us we had about $70. The ride was very nice as he took us around the island. We passed right by the Grand Hotel, several nice stables and many of the private homes on the island. Boy, are they nice! The owner’s names were very recognizable. After the tour we took our bikes and started on the ride around the island. Riding a bike is like riding an obstacle course. If everyone had brought their bikes and knew how to ride it would be nice but that is surely not the case. Of course there were many rented bikes of all sizes, even tandem bikes. At one point I surely wished Jerry and I were pedaling together! The bike ride to the Arch was a nice ride and in fact we had passed it before we realized it so we turned around and went back. We locked the bikes up on the bike rack and began the 207 steps up to the Arch. About half way up there is a rest stop and Jerry reached in his pocket to get his iPhone out to take a picture only to frantically realize that it was still on his bike. Back down the stairs he went. Luckily it was still on the bike but then he had to climb the stairs again. We finally reached the top and it was well worth it despite the crowd. The view of Lake Huron is incredible to say the least. When we climbed back down it had begun to sprinkle so we sat on the benches for a few minutes hoping that it would pass. It didn’t so we valiantly continued on our 8.2 mile ride around the island. After about 4 miles and a BIG hill that I finally walked up the wind picked up and the rain began to blow. I finally caught up with Jerry and we stopped at the rest station where there was a phone and bathrooms – and a locked building. By this time I was cold and a little wet. I couldn’t wear my visor because it would blow off and I couldn’t take off my sunglasses which were covered with rain because then my contacts would blow out. When I got to that rest stop my question to Jerry of course was “are we having fun yet?” We carried on though and the trail got easier and the weather improved. In fact my eighth mile was my fastest mile! Our next stop was the Pink Pony for lunch. Although there was a line for inside we elected to sit outside so we had no wait. We both got the burgers and chips and they were good. Afterward we just walked around the shops some. 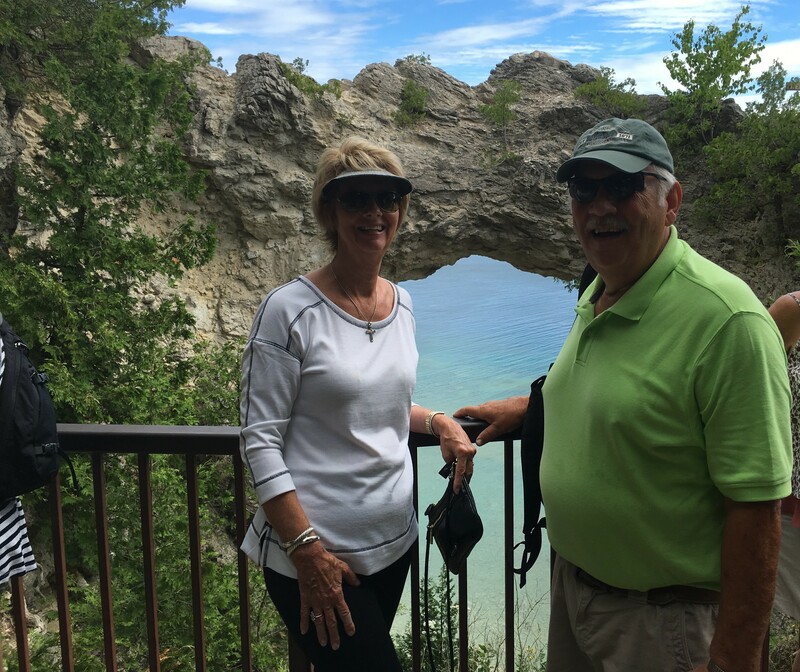 To say that Mackinaw Island is fascinating is absolutely an understatement. There are throngs of people going in all different directions, some trying to cross the street amidst the cyclists, walkers and the horse and buggies. Apparently because it was a week day and poor weather there weren’t as many people there as usual. I can’t imagine more. Our van driver told us that about 6000 people a day go over! After walking around some we decided to ride our bikes to the other end and possibly find the Grand Hotel. A mile later we turned around realizing that we had totally missed the turns. By this time it had really begun to rain so we parked the bikes and walked around the stores some more. Of course I got a magnet saying that we had ridden the 8.2 miles plus I got a sweatshirt. We went into one of the many ice cream shops and had a cone of ice cream. We also went in and out of a couple of fudge shops and sampled their wares. By this time we were too full to think about buying any! Since it was raining so hard we decided to return to the campground and as luck would have it we pulled up to the dock just minutes before the St. Ignace ferry was leaving so we were able to quickly get on and get settled. The ride back was direct, no looking at the bridge so it was fast. When we got back to the coach we fixed a cup of coffee and just rested for a bit. The plan was to bake the pasties we had bought in Traverse City earlier but that didn’t happen. I went to sleep on the sofa and after a little rest Jerry got up and fixed some more sausage balls. I just couldn’t seem to wake up so I finally had two sausage balls and some tea for dinner and went to bed! It was a great day but tiring. Today was definitely “Hit the Wall” day! We both have been going full blast since the first of July and today we just ran out of steam. Although we had plans to be up by 7:00, have our 6 mile ride and then get to the Visitor’s Center in Traverse City by 9:00 that plan failed. Neither of us could get to sleep last night and I think there were a couple of reasons. One, our bodies just haven’t acclimated to it being light so late. I know that sounds a bit silly but we’re usually in and quiet by 9:00 but this week we’re still sitting outside reading, visiting or I’m inside working on the computer. Also, Jerry finally got his State flag up and last night it was windy and the flag was proudly and loudly flying. Finally about 12:30 Jerry got up and went outside and took it down. He was so frustrated he just went out the door in his underwear. Fortunately he had on a t-shirt and no one was up! We did get our six mile ride in but for me it was a real struggle. I just rode around the top part of the campground trying to avoid as many hills as I could. We finally got to the Visitor’s Center about 11:00 but unfortunately the lady we talked to wasn’t a bit of help. When I asked for suggestions her reply was “instead of shopping?”. Well duh, yeah. If we had just wanted to shop we surely could have found the shops! After we mentioned a lighthouse she finally suggested Old Mission Peninsula. We also asked about somewhere to eat the local pastie. She pondered it a bit and finally suggested Cousin Jenny’s which was fairly close. We went back to the car, paid the parking meter and using Mapquest and Waze we set out seeking Cousin Jenny’s. Hello Mapquest! Hello Waze! Cousin Jenny’s was two blocks away, straight down the street. Why, oh why in the 90 degree sunny heat did they send us on a 30 minute circular tour of the city? We finally made it and all I could ask for was a glass of water after walking at least one mile. We both got the meat pastie which included steak, potatoes, onion, rutabaga and seasoning. When they brought it to the table they suggested various condiments to go along with it: sour cream, Cousin Jenny’s Dynamite Sauce, some gravy and something else that Jerry said tasted similar to mustard. Expecting to taste something similar to the meat pies we had in Louisiana we were very pleasantly surprised. Although Jerry thought it was a little bland I thoroughly enjoyed mine. In fact we later went back and got four more, two for dinner on our travel day (tomorrow) and two to freeze plus I got some of the hot sauce as well. We then walked two whole blocks to our car. I think it took four minutes! We rode to the Old Mission Peninsula and it was a pretty ride. There are 10 wineries along the way and various cherry stands as well. The Old Mission Lighthouse is located at the tip of the Old Mission Peninsula. Built in 1870 this lighthouse is located at the end of nineteen-mile-long Old Mission Peninsula. It divides Grand Traverse Bay into a west arm and an east arm. We elected not to climb the lighthouse as we’ve already climbed three plus it is enclosed at the top. Just a few hundred feet north of the point lies the invisible line, the 45th parallel of latitude which marks the halfway point between the Equator and the North Pole. 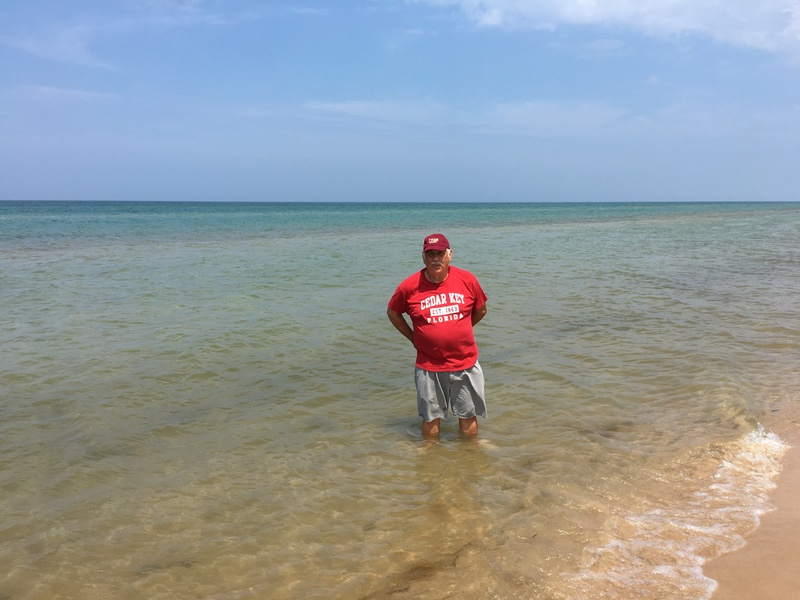 We stuck our toes in the water and surprisingly it was much warmer than Lake Michigan. As with the other beaches there were people in the water and some tanning on the beach. We also visited the Hessler Log Home which was built by early settlers. It is amazing to see the smooth walls and the dove-tailed joints that were hand cut from the pine trees. There are no nails or fasteners in the home. Driving out of the peninsula we stopped to buy some cherries and ended up also getting some Moomers ice cream only sold in Michigan. Jerry got a mint ice cream covered in heavy chocolate and I got a cup of amaretto cherry. After eating a bit we exchanged and we both like the other’s better! It was really good and I hope we can get some more before we leave the state. After a brief stop at Cousin Jenny’s we came on back to the campground where we both collapsed with fatigue. After a lazy afternoon nap punctuated by rain on the roof I cooked a good dinner of meatloaf, butter beans and creamed potatoes. 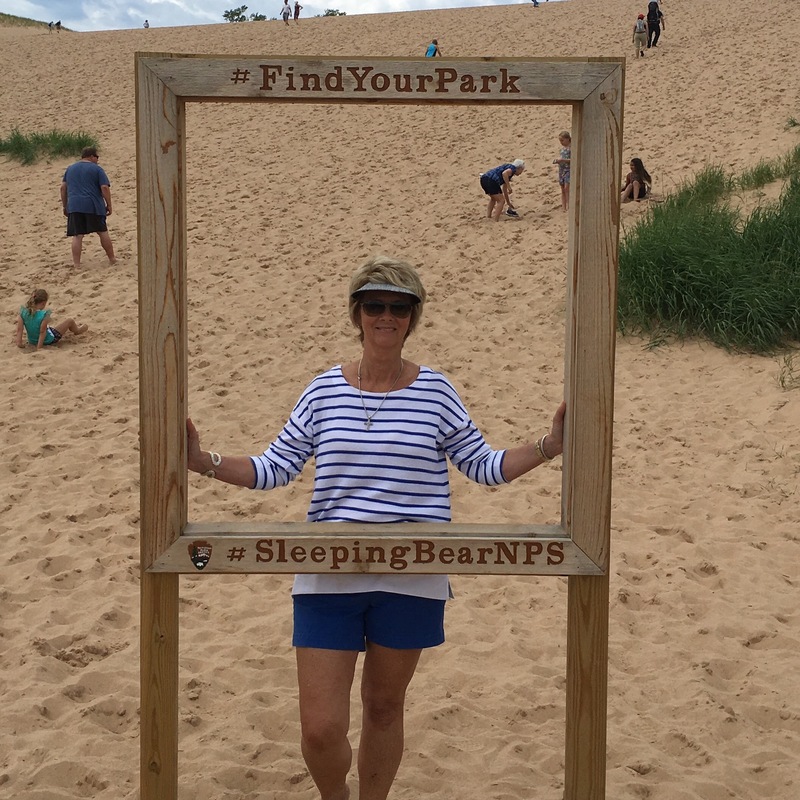 Our first stop today was the Sleeping Bear Dunes National Park. Because we have the America the Beautiful pass we were able to get in at no cost. The dune is tremendous – so high but I was determined to climb it. Jerry headed toward to the bathroom and I headed for the dune. It was a climb to say the least but I made it to the top – kind of. To get to the other side of the dune to see Lake Michigan was another mile and a half and I’ve already seen Lake Michigan. The view towards Glen Lake was enough for me. 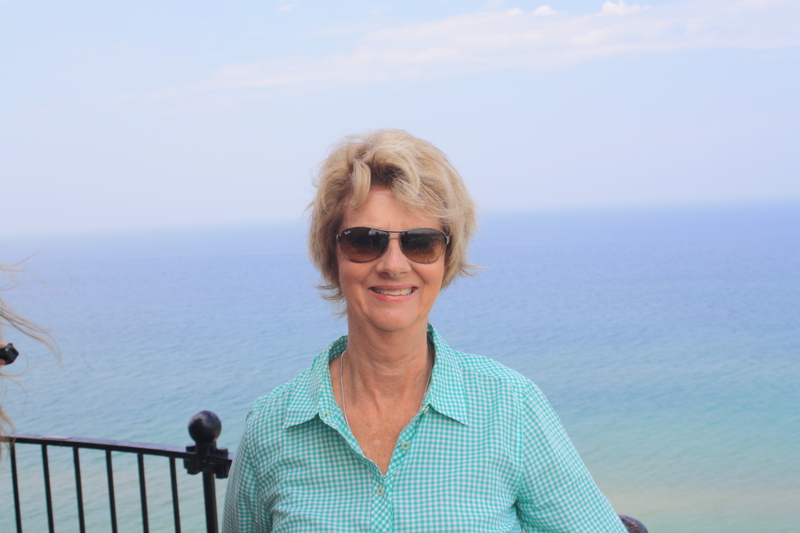 I clambered down, bought the magnet and then we headed for Glen Haven, a small village on the shore of Lake Michigan. Originally a company town known for farming and canning it is one of the few towns that survived and that is probably due to the foresight of D. H. Day who was first logging the trees and then added a fruit cannery. Today the historic town which is now owned by the National Park Service includes a general store, a boat museum, a blacksmith shop and a maritime museum. The Maritime Museum is the original Sleeping Bear Point U.S. Life-Saving Station which was moved to its present location because the encroaching sand dunes were beginning to bury it in sand. The house is an amazing recreation of life during the treacherous early days. After viewing all of the rooms we entered the Pilot House room. 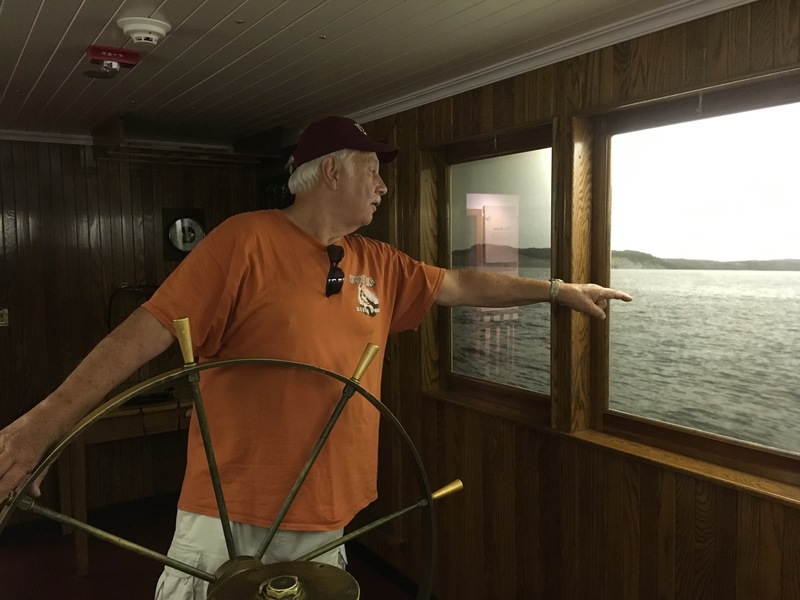 It was just like being at the helm on the ship – a little eerie! 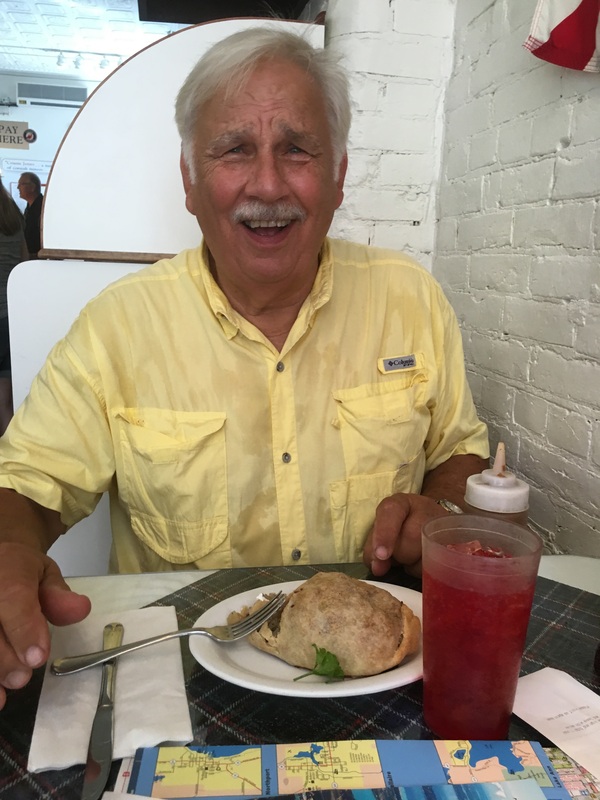 We considered going to Leland and taking the ferry to the North Manitou Lighthouse but a day pass was $40 per person and it was already 3:00 so we decided to go on to the Grand Traverse Lighthouse in Northport. 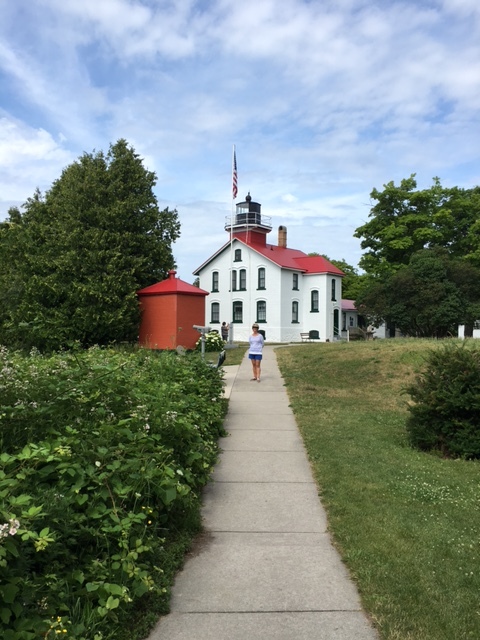 Located at Leelanau State Park, the lighthouse has been restored to include a museum showcasing the life of a lighthouse keeper and his family. The wife must have been musical because there were two organs in the house. This was a very different lighthouse in that we didn’t have 130 steps to climb and the top was enclosed. Also on the grounds is the Fog House which is a tribute to World War II. After the attack at Pearl Harbor Lake Michigan was the only body of water in the United States not touched by foreign soil and because it mirrored the waters of the Atlantic and Pacific it became a mecca for training for aircraft carriers. There is a great deal of history in that one little building. Our trip back to Traverse City followed the coast line and the scenic Lake Michigan. Every inch that I have seen is indescribably beautiful – what a nice place to live – during the summer that is! We stopped at the grocery store yet again and got hamburgers to grill for dinner. After dinner we sat outside for a while, visited with the new neighbors from Arkansas and then Jerry later visited with a guy originally from Durham. Small world. It’s 10:00 now and finally dark – good night! Today was a travel day but we didn’t have to check out until 12:00 so after breakfast we got the bikes out and rode back into Silver Lake again and all of the way to Mac’s Dune Buggies. The first part was good but the 5th mile going back was so difficult that at one point I just had to stop. That was one steep hill! We packed up and then pulled up to the entrance parking lot where we put the car on the dolly and then took off for Traverse City which is only a little over 100 miles away. Everything was going well until we were going through some little town and Jerry hit a curb and the pantry, refrigerator and freezer came open and things began to fall out. I hurried back and was trying to gather the falling objects when apparently he went around a curve and I ended up on the floor between the table and the wall. When it was all said and done I felt like I had been in a wreck. If that’s all that happens on this trip we’ll be some blessed people! We got to the Holiday Park Campground a little after 2:00 and it was one of the easiest set-ups we’ve ever had. First, the campground was located on Hwy 31 which is the one we were on so we drove right to it, no hunting around for it. Set-up was easy and quick. Holiday Campground is a very large park and when you enter you see lots of shaded lots. Unfortunately that is not where they put the travelers. We are on the very last row and as our neighbor said “not a tree in sight”! There is a lake for swimming but it’s pretty far from us. Still we are safe and secure in our little home away from home. After a quick lunch we decided to go to the grocery store to get some steaks to grill for tonight and that turned into a little explore and discovery. Garmin will take you places you never thought you’d go and for us, we usually end up on a dirt road! 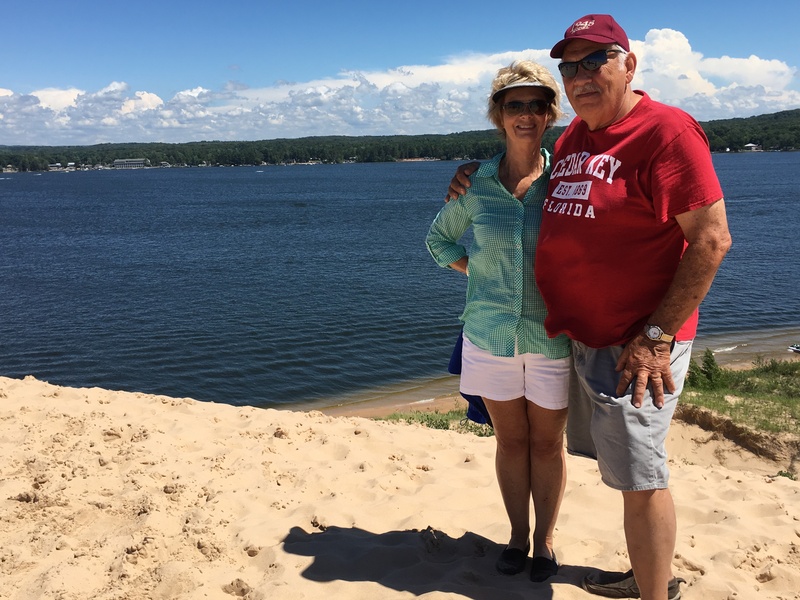 We finally found Traverse City and rode down Front Street located on Grand Traverse Bay. Lots of people were out on the beach, in the water and boats were on the move. We finally found a grocery store, got the necessary things and headed back to the campground. It was a straight shot, only about a 15 minute ride. Go Garmin! Interestingly enough we rode by shopping centers, Best Buy, car dealerships and then amazingly a pasture with about 15-20 buffalo in it! Dang it, I couldn’t get my camera out. Got back to the campground and Jerry grilled steaks. We sat outside for a while – the weather is so nice and then we rode two more miles on the bikes! With it staying light so late even if we get a late start and we often do, we can still get a lot done. Today was a very hard day but a great day. Six miles on a bicycle and five miles walking will get the best of men but we did it! We started the day by riding our bikes to Silver Lake, around the roundabout and on to Mac’s Dune Buggy Rides where we turned around. When we turned out of Silver Lake RV there was a steep incline that we had to ride up and then one more and the rest was pretty level. Most of the way into Silver Lake and then towards Mac’s had good bike trails and there are also bike crossings. I now know what a bike crossing sign means to car drivers – keep going, the bikes will either stop (I did) or get out of your way ( I did). They really are just drawings on the highway. We rode three miles and then turned around. It was a great ride and hopefully we can do it again tomorrow. The weather was cool, windy and overcast. I wore yoga pants and a long sleeved t-shirt and was fine. I put a jacket in my basket just in case it started raining but I never needed it. I stopped at the office when we returned to check on when we could move to our new spot. They told me that the spot we were going to had not been vacated and the folks didn’t have to leave until check-out time at 12:00. I came on back to the coach and Jerry and I both took showers and got dressed just in case they decided to leave early. Afterward Jerry took a nap and I read. A knock on the door around 11:00 told us that the site was vacant so we packed up and drove over. A little inconvenience for a full hookup was surely worth it and it didn’t take long at all to set back up. As son as that was done we headed out for MacDonald’s in Hart to do our updating and check e-mails but on the way decided to go on to Ludington and have lunch there. We ended up at the Kuntry Kupboard. I accessed the TripAdvisor app and the reviews were good and the menu seemed to be varied. A good indication of good food is a full parking lot and this one was full so we headed in. As soon as we sat down we both ordered coffee as we were both a bit chilled from the weather. We both got soup and the salad bar and they were both good. We ended our meal with fruit from the salad bar. While we were eating the sun came out and the temperature went up as well. It was turning out to be a beautiful day. 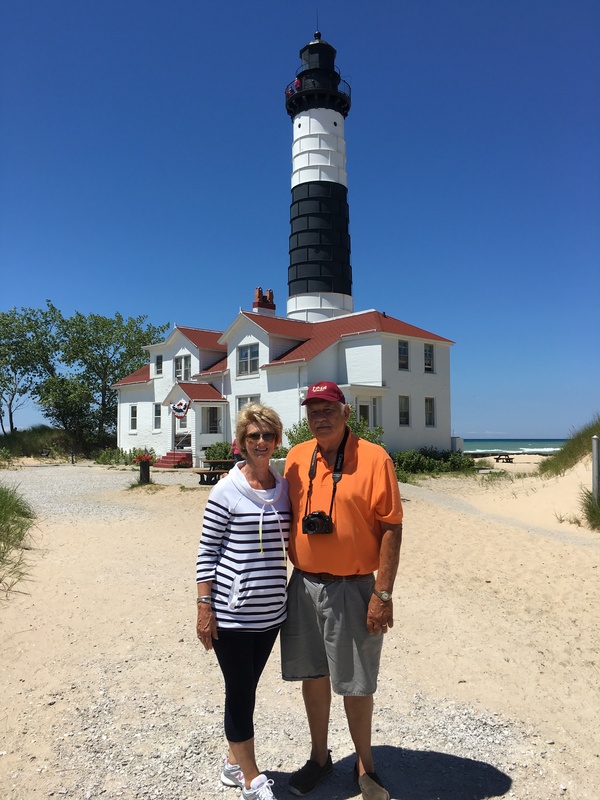 With full tummies we headed out for Ludington State Park and Big Sable lighthouse. We paid the $9.00 to get into the park for the day and then began the hike. We didn’t realize that it was 2 miles to the lighthouse but it was a nice day for a walk. We went through the park campground and then headed out of the lane to the lighthouse. There were many people coming and going and it was an easy walk. 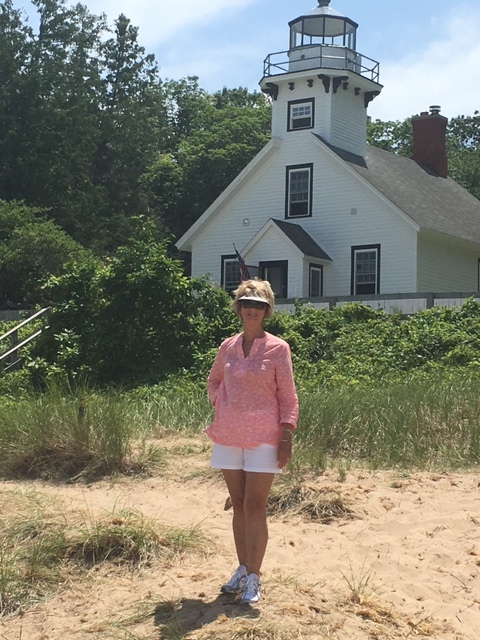 Big Sable Lighthouse is actually attached to a house and is situated right on Lake Michigan. To say that the view is beautiful vastly understates the obvious. The many different colors of the water is reminiscent of the Caribbean waters. The surf reminded me though of the ocean with the waves crashing to the shore. We climbed the 130 steps to the top and then walked around. I stayed close to the side of the wall but I did it. I only looked down once and that was enough so from then on I kept my eyes focused on the view. Two miles later we were hot, tired and Jerry was not at all interested in seeing another lighthouse which had been my plan. 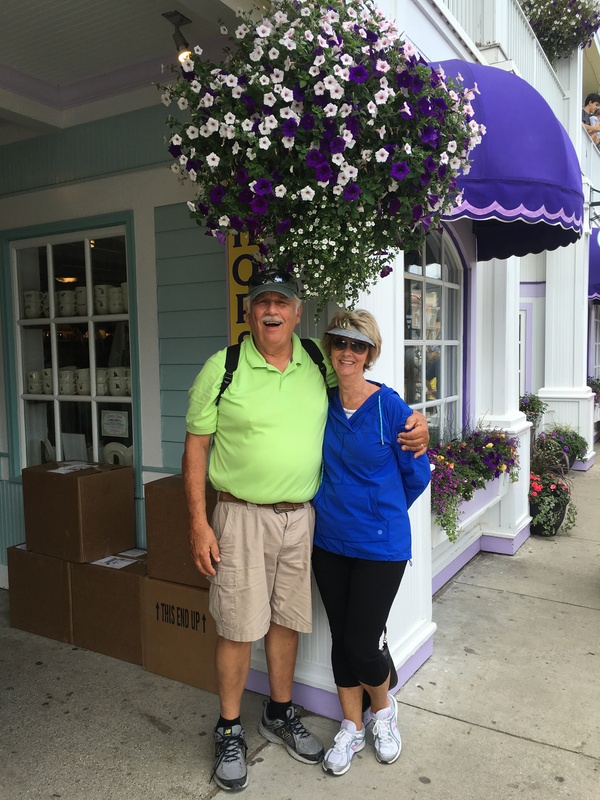 We rode on into Ludington and down Ludington Avenue to see a street lined with petunias. When I heard the description I was reminded of Niagara on the Lake with their many floral hanging baskets but Ludington Avenue had petunias planted in the median. 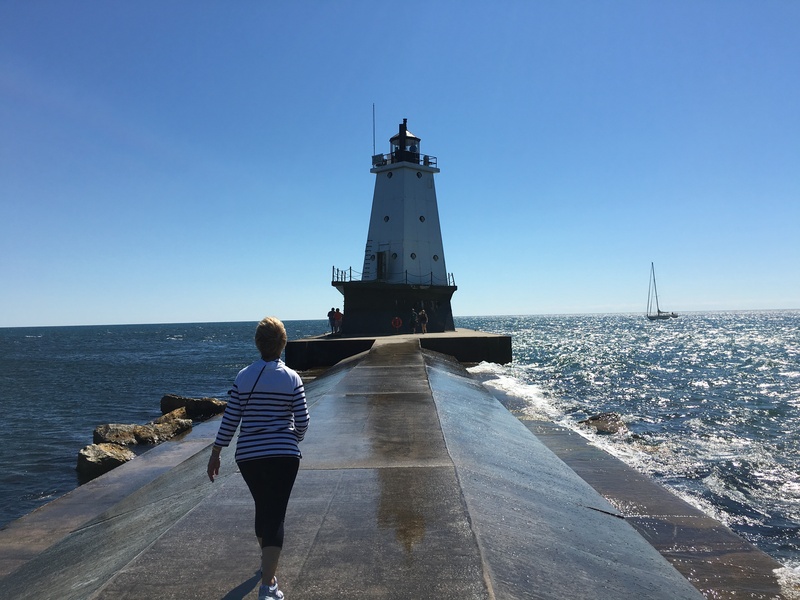 We then rode to Stearns Park to see Ludington North Breakwater Lighthouse. We quickly realized that we had just ridden by the park but didn’t realize that was where the lighthouse was. We turned in and parked and Jerry saw the lighthouse. It is the most visited lighthouse in Michigan and I can see why. It’s at the end of a breakwater. The water on one side is rough with crashing waves and on the other side it’s calm. Water was splashing up on us as we walked the half mile out. We opted not to climb the lighthouse since the only advantage would be a beautiful view and we already had that as we sat outside the gift shop. We sat there for a few minutes and then lumbered back to the car, probably nearly another mile. We were both exhausted and decided to stop at a grocery store, get a loaf of bread and have sandwiches for dinner. When we got back to the coach we both collapsed. We were tired and sore! I wanted to go to the pool for a swim but couldn’t talk Jerry into it so we had a very quiet night. It remains very strange to me that it stays light so late. At 8:00 the sun is shining brightly. We both certainly needed to recuperate from the two days of hard preparation for the trip and the actual traveling so we slept in today. I finally got up about 8:30 but Jerry just continued to sleep until after 10:00. I know he must have been exhausted. He drove nearly 1000 miles in two days and most of it in one day. We have very, very limited – interpret that as no Internet so no checking e-mail this morning so I very quietly read while he slept. Finally some after 10:00 I tried to very quietly take a shower. I think I was pretty quiet but he got up anyway. We had an early lunch and then left for the Little Sable Lighthouse on the other end of Silver Lake. 133 steps and then out at the top. I didn’t think I could go out but I did and walked around the entire top. Quite frankly the most difficult thing was going down the steps! The view of Lake Michigan is incredible with varying colors in the water due to the sandbars. I’m glad I braved the climb – it was well worth it. When we got down we walked down to the sandy beach and I stuck my toes in Lake Michigan. It was so very cold I could see why the folks go south for the beaches. There were several people including children braving the waters but I couldn’t have done it. I guess if that’s what you’re used to it’s no problem. Our next stop was Silver Lake State Park just to park and get out and look at the incredible dunes across Silver Lake. They are indescribably beautiful and awesome. We finally got our sandy feet clean and headed back to the coach for a little while and then we were on the way to Mac’s Dune Buggy Rides. Boy, that was fun. Along with several others including four from Winston Salem we took a ride over and through the dunes. At one point we stopped and took some pictures and some brave souls slid down the dune toward the water. The only problem with that – you have to climb back up. We elected not to do that! After the ride we chatted with the North Carolina folks for a few minutes and they recommended that we ride down to the cherry stand a few miles down. We rode down there but since we had cherries in the fridge we didn’t buy any. Our next stop was the MacDonald’s in Hart where they had free Wi-Fi! I downloaded a new book and we updated our apps plus checked our e-mails. Back to the coach for an early dinner of left-overs and then a bike ride! We rode our six miles around the campground. We certainly didn’t know that there was such a steep ride on a couple of the lanes. We rode slower than usual and obviously our time was the longest we’ve had but neither of us was as exhausted as we usually are after our rides. Jerry locked the bikes up and we walked around the park to cool down. We had hoped to take a dip in the heated pool but it was full of children so we walked on back to the RV. Jerry wants to ride the bikes in the morning so we took the car into Silver Lake trying to determine the route we should take. Each little hill looked like a mountain when we thought of pedaling up them. After we got into Silver Lake we rode around the village looking for the best way to go and we finally decided to go by the State Park. I don’t think we’ll have any trouble getting there. I just hope we don’t run out of steam before we get back to the campground! Still not used to it staying light so long. I wonder what time the sun comes up. I’m quite sure it had been up a long time by the time I got out of bed this morning. Earlier today the wind picked up and it looked like we might have a storm. We didn’t but the temperature dropped and it’s quite cool tonight. Jerry decided in lieu of going to sleep at 8:30 he’d make us some sausage balls. I’m going to put on my warm pj’s and read some! One day we’re going to start on a trip with no difficulties, no snags, and no delays. Now, I don’t know when that will be but it surely wasn’t today. As I stated earlier we had planned to leave early Wednesday morning but the bike problem delayed that until at least 10:30. I got up early and fortunately Jerry slept in – he’ll need it later today! After coffee, paying bills and waking up I rode my 6 miles – wow it was so hot! It’ll be interesting to find out what the heat index was for today. After I cooled off I got busy in the kitchen. I made two meat loafs, mixed the spaghetti sauce in the crockpot which will cook as we travel and made some House Seasoning to be used later. I continued to put things in the RV, .e. frozen food, refrigerated foods, etc. Burt called and had been able to true the rim so Jerry went down and picked up his bike. After returning home he realized that since he had altered the tow dolly to accommodate the bikes the safety chains were too short so he had to go to Lowe’s for extensions. When he got back we finally got the bikes on the rack and the tow dolly hitched only to realize that since we were leaving so late we would probably end up boondocking somewhere tonight so that meant we had to add water to the fresh water tank. Naturally the hoses wouldn’t reach so we had to back up the coach which already had the two dolly connected. All of this was done is 90 degree plus heat and high humidity. I dried my hair three times! We finally left at 12:33 only to realize that Jerry didn’t bring any jeans so we circled the Briary, stopped in front of the house and I ran in and got him a couple of pairs. It was a good thing I did go back in because the alarm was beeping. I don’t know what is wrong with it but it keeps intermittently beeping and it hasn’t even been set. I turned it off and we started out again. As we neared Mallards (about five miles out of Kinston) we saw that gas was $1.97 so we pulled in and Jerry filled up while I went to the fruit stand. I got some fresh tomatoes, some baking potatoes for tomorrow’s dinner and a cantaloupe since we never got around to making our sausage balls. We finally left Mallards at 1:08 on our way to – oh, where are we going tonight? Certainly not Piketon, Ohio where we had intended to go. Should be interesting. Before we left we kissed for luck and then prayed for safe travel for us and safety for all of our children and grands. The rest of the day was pretty uneventful. We just traveled along. I intermittently spent time on the iPad trying to figure out how far we could go and where we might stay. Our original destination was the Chillicoathe, Ohio area and we knew we couldn’t make it that far. We entered West Virginia and the dratted toll booths. Wide loads should go in the far right lane but Jerry didn’t on the first one and I heard a scrape (later looked for a scratch or worse but didn’t see anything). We went through three toll booths at $3.25 each. You would think that toll roads would be in better condition but that was not the case today. For the most part it was a bumpy ride! I finally located a Walmart in Quincy (Belle), WVA and we decided that we would try boondocking for the night! Wow! As we pulled in we saw two other RV’s parked there so we assumed it would be OK to park there. As soon as we were parked Jerry went to the store to check in with the manager who said it was fine to park there, the only rule being leave no trash. Using the inverter I cooked the noodles to go with the spaghetti sauce that had been cooking in the crock pot and fixed a pear salad. We didn’t pull out any slides although we noticed that one coach had three of theirs pulled out. No one had any jacks down. Since there were no rules regarding generator use Jerry turned ours on and the coach started cooling down immediately. It’s nearly as hot in West Virginia as it is in North Carolina and after all, we are in a tin can. It doesn’t take long for things to start warming up! Although a bit cramped we pulled out the table and had our dinner. As soon as I took a bite of the pear salad I realized that it was abnormally sweet. I didn’t say anything waiting for Jerry to remark. He did. Reading the can label we realized that I had bought cinnamon flavored pears. They weren’t terrible but Jerry did ask me how may cans I bought. Fortunately, only one! After dinner we walked over to the store to get a manual can opener and then headed back to the coach. We were both pretty tired. By this time it was after 9:00 so we both pretty much collapsed. Jerry grabbed his pillow and headed for the sofa because we were both pretty sure he would be snoring loudly tonight. If he did I never heard it. Surprisingly I slept well only awaking a couple of times. Fatigue can do that to you! I guess we are officially Wally Dockers now! We have been preparing for some time for our trip to Michigan with each day specifically planned since we were working with a limited amount of time. The day of departure was scheduled for early morning July 6. Let me go back a bit and explain. We are blessed to have a cottage on the river and were doubly blessed to have one of our sons and his family down for the Fourth of July celebration. Since we knew we’d be pushing the envelope to be able to leave from Kinston on the 6th we left the river on June 20, returned to Kinston, brought the coach home from the warehouse and did as much as we could to get it prepared to leave. Due to the heat in the warehouse we had earlier taken out most of the condiments, etc so we got all of those out and set them on the dining room table ready to be put back in when we brought it home on the 5th. We knew most of the clothes we had at the river would just transfer right to the RV so packing was going to be fairly easy. Right? Well, yeah, that all worked out but there was an unexpected fly in the ointment. A few weeks earlier Jerry and I bit the bullet and bought bicycles. We have been faithfully riding 6 miles 6 days a week. I know for some of you cyclists it’s not very far but we’re pretty proud of ourselves! Last Friday while Jerry and I were at the grocery store David decided to ride Jerry’s bike. Yep, it wrecked and bent the rim on the front tire. Oh no! Jerry immediately called the bike shop and then took the tire back to Kinston. Burt, the owner of Riverside Bikes told us he would try to true the rim but would also order a new one and it would be in Tuesday. We weren’t extremely optimistic but were hopeful that it would be repaired. After all, much of our Michigan trip involved biking. Our original plan was to leave early Wednesday morning and drive about 500 miles to Chillicothe, Ohio for the night and then arrive in Mears, Mi, which is about 450 miles from Chillicothe on Thursday. We did not have reservations in the Chillicothe area but do have reservations in Mears! Oh my! Right now we have extra time to get the coach packed and prepare some extra food. Somehow I don’t think we’ll be spending tomorrow night in Chillicothe!